While researching the history of Indianapolis for a possible future novella, I was surprised to learn that I share a birthday—January 10th—with the capital of my Hoosier State! As it turns out, we also share unpropitious beginnings. I was born in a small town; actually the small town John Mellencamp referenced in his song of the same name. Indianapolis, too, had humble beginnings. 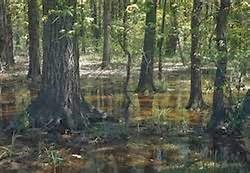 It began as a backwoods swamp. 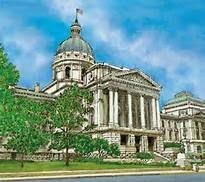 Nearly everyone outside the handful of visionaries who saw the benefit of situating Indiana’s capital city in the center of the state, considered the choice both baffling and a grand folly. In 1816 when Indiana became the 19th state in the Union, Corydon, a town on the state’s southern border served as the capital. In those days, rivers and other major waterways were the superhighways of their time. Corydon, situated near the Ohio River, could be accessed by boat from any point in the country. However the same time Indiana gained statehood, the U.S. Government set aside land in the central part of the state for a capital since most states were centrally locating their seats of government. In 1820, prominent members of the Indiana legislature embraced the notion of a new capital city set smack dab in the center of Indiana. Most residents of the new Hoosier state considered the idea lunacy; the central part of the state was but a wooded swampy marsh still peopled exclusively by Native American tribes, and not accessible by a major waterway. 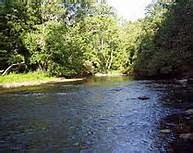 Undaunted, the proponents of the move insisted that the west fork of the White River, which did flow through the proposed site, would allow access to the new capital. Later, that stream proved far too shallow and pocked with sandbars to be navigable by most boats, but by the time this fact became evident the deed was done. 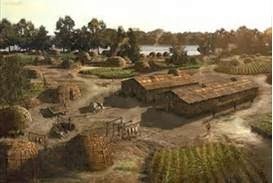 January 10th, 1825, the little capital that could was moved from Corydon to Indiana’s swampy midsection near a little pioneer settlement called Fall Creek. The town’s new name would be Indianapolis, joining “Indiana” with “polis,” the Greek word for city. Architects Alexander Ralston and Elia Pym Fordam were chosen to design the city of Indianapolis. Ralston, an apprentice to Pierre L’Enfant the French architect who’d designed Washington D.C., plotted Indianapolis on one square mile centered by a circular common. 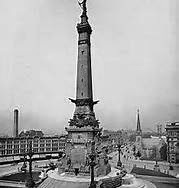 That circular center, originally called Governor’s Circle and planned to be the site of the governor’s mansion, later became Monument Circle; the site of the iconic Soldiers and Sailors Monument, completed in 1901. 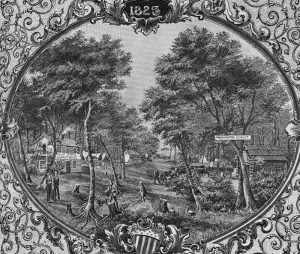 Thanks to the National Road which reached Indianapolis in 1831 and the Madison & Indianapolis Railroad that arrived in 1847, the lack of a navigable waterway was no longer an issue and the city flourished. 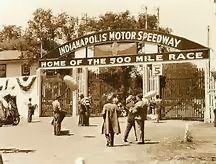 By the turn of the last century Indianapolis became a leader in automobile manufacturing which, in 1911, spawned the Indianapolis Motor Speedway and its now world renowned 500 mile open-wheel automobile race. Throw in the NASCAR 400, a professional basketball franchise, and a professional football franchise, and Indianapolis has come a long way from that miasmic backwoods swamp. As for me, hey, Indianapolis proves that however humble your beginnings, anything is possible. Your post was so interesting. Thank you! 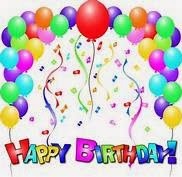 And Ramona, have a great, great birthday!!!!!! Such interesting history, Ramona. 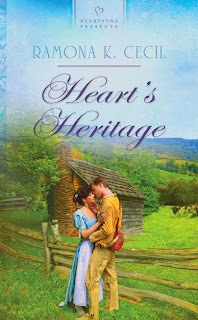 With that connection, no wonder you are able to put so much great history in your novels! Thank you for sharing this history of Indianapolis and its humble beginnings. I hope you enjoy a wonderful birthday on the 10th! !